Tim Mullooly: Welcome back to Living with Money, this is Tim Mullooly. On today’s episode I’m joined by one of my very best friends, Kenny Taylor. Ken is the assistant director of operations at Casino Pier. Ken, thanks for coming on, man. Kenny Taylor: Thanks for having me, Tim. 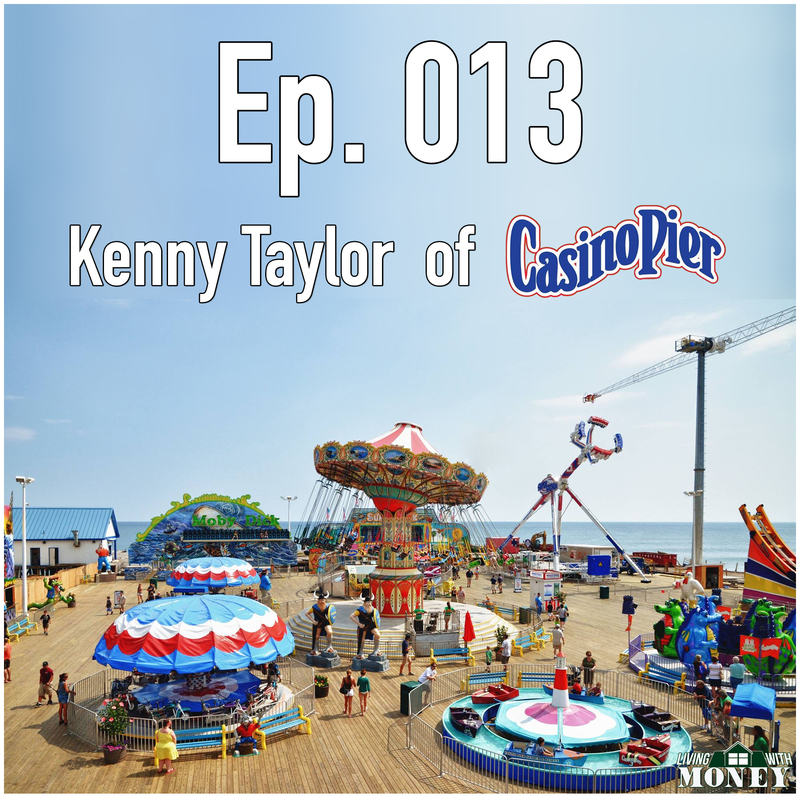 Tim Mullooly: Me and Ken have been very good friends for a long time, but for anyone listening out there who doesn’t know what Casino Pier does or a little bit about Ken, do you want to explain just a quick background on yourself on how you got to where you are now? Kenny Taylor: Yeah, sure. Well as you guys know, me and Tim have been buddies for a long time. A little bit about Casino Pier and Jenkinson’s Boardwalk. Jenkinson’s has been in my family since the ’70s. It was originally started by a guy named Orlo Jenkinson in the 1920s, actually they’re … Jenkinson’s is celebrating their 90th anniversary this year, and my family got involved, like I said, in the late ’70s and it’s been in the family ever since. Casino Pier has been in the family since the early 2000s and I came along at Casino Pier specifically in 2013-2014, but before that I was working at Jenkinson’s. Tim Mullooly: Right after college you joined on with Casino Pier? Kenny Taylor: Yeah, I … Well I went to Holy Cross in Worcester, Massachusetts and I actually … I mistakenly went to the school … Well not mistakenly, but Holy Cross was my reach school per se, as in the school as a pie in the sky, ‘Oh I’ll apply, see if I can get in, and I got in, and I didn’t realize that they didn’t have a business program. I was like, ‘I don’t want to turn down this opportunity going to such a great school,’ so I went in, I tried my hand at economics, and I’m not the greatest math person. It got a little difficult, and I didn’t do so hot in there, but I decided to stick around and I did history, which was actually my first passion. I really like history, I still do to this day, can always learn from it. So I decided to stick with history and graduated with a history degree, and then after college, I was at Casino Pier working and I decided for myself, I wanted to pursue some kind of business program of any sort, so I found a graduate program at Catholic online, Catholic in Washington D.C. and I was able to get my business management masters and work at the same time, so now I have that background as well. I have to do a little bit of something that I’m very interested in, and something I need for the future, so it all worked out. Tim Mullooly: Right, exactly. You wanted to get that masters to help with the … Your career along the way. Tim Mullooly: It’s been an unintended theme of some of the guests that we’ve had on here, but we’ve had a handful of family businesses and obviously at Mullooly Asset Management is a family business as well, so I always like to ask what’s it been like working with some of your family members throughout the years? Kenny Taylor: Well growing up it was just your summer job basically. You didn’t think of it as a career at the time, and me personally, I’ve had all sorts of odd end jobs when I was 14, and I worked a waffles and ice cream stand by myself on Labor Day weekend. Kenny Taylor: That was a thrown into the wolves and see how you can do. Then after that I was turning hotdogs at a stand called Little Mac’s for a couple years, worked as a manager on the beach and I had a nice staff of 14-15 year olds and badge checkers, and that was a good time. We had a great staff, and then towards the end of college, I realized that here I am, it’s going to be a career soon. When you’re growing up, you don’t think of it as a career. As a kid, your parents, or my parents specifically, it was just your summer job, but I made a conscious effort towards the end of high school into college. I had this opportunity, why would I not pursue it, and it was never forced on us, I don’t think anyone, my grandparents, none of my uncles or my parents specifically forced the business on us. Tim Mullooly: Get passed on to someone else. Kenny Taylor: Yeah, didn’t want to one day go up to Jenkinson’s or Casino Pier with my kids and say, “Well, you know, we used to … This used to be ours. My grandpa started this.” It’s just a big realization and I’m glad I’ve decided to move along. Tim Mullooly: It’s always good to keep things in the family. Tim Mullooly: Like you’re saying, you want to see their hard work continue on through your family and it’s just a cool thing to later on in life be able to say that it was passed down all these years through generations. Kenny Taylor: Yeah, statistically, I learned this in graduate school that the family businesses tend to struggle in the third generation, even more into the fourth, and being that we’re in the third now, I don’t want to be another number. Tim Mullooly: Well for anyone out there listening who might be hesitant to work in a family business, I hear a lot from people like, “I don’t know how you could work with your family, I never could.” For someone who might be hesitant to work with family, what’s one thing you would say to them to make it easier or to encourage them maybe to work with their family? Kenny Taylor: Well to begin with, if you are in that second generation or third generation per se, and you have children that are either in that … They’re in their teenage years or they’re thinking about joining the business, or even if you have little kids, one thing I’ve learned is that you always, whenever you talk about the business, you always want to talk about it positively. Tim Mullooly: Yeah, all Dad does is complain about the business, why would I want to join that? Kenny Taylor: Exactly. That and you want to create opportunities at an early age for your kids to start getting familiar, start getting to know the people there, even if it’s something minor like “Here,” over the Easter sale, “Here can you stuff these envelopes for the shipping orders.” I feel like that engagement with employees and the business itself goes a long way. Tim Mullooly: Right. You start to build the relationship with some of the people that are there, and also get them invested in the work that’s going on without pushing them too hard towards that. You’re getting them involved, so they take their own interest. Casino Pier obviously, and Jenkinson’s have very different seasons busy versus the off season. Could you describe what a normal day is like for you during the busy season, and then what it’s like during the off season, because I’m sure it’s night and day. Kenny Taylor: Yeah. Summer time is a very … It’s a different animal compared to the winter time. It’s a … You think about it, you … As a business, as a seasonal business specifically, you have a short amount of time to make your years’ worth of income basically. So you’re putting in a lot of hours, you’re putting in a lot of work. A typical day for me, it depends on the day, usually it’ll start at 11:00 or 12:00, and I’ll work sometimes till midnight-1:00. I’m basically as my … The guy I work with, Lou, he says, “We’re putting’ out fires essentially.” We walk around and we try to prevent or correct potential issues or problems that are going on and we’re constantly checking up on our department heads and our managers, making sure everything’s flowing right. I see it almost as a clock maker, you work so hard in the off season you build this clock, and then Memorial Day just let it go and hope it ticks. Then, any other problems along the way, you just keep making corrections to it so it keeps going. Tim Mullooly: Just have to keep that clock ticking. Kenny Taylor: Yeah. I guess a lot of my work load in this … In the summer time is I do a lot of the technology aspect of the business. I’m not … I’m no tech wizard per se, but we have … We’re on a cashless system and a lot of it is you get a card rather than ride tickets, and you scan them at the rides. My job is usually to make sure that those readers are working fine, and that whatever entitlement or credit is on the card, it’s being accepted, and we run into a lot issues with that. Some cards don’t have the right things on it and I have to look up the orders, but it’s one of those things where I was handed the task, and they said, “Learn it,” and gave it my shot. Did one of those, yeah. Tim Mullooly: It’s okay, you’re the tech guy now, figure it out. Tim Mullooly: Do you deal with a lot rowdy guest sometime in the summer? Tim Mullooly: Numb to it now almost? Kenny Taylor: I’m still trying to get used to it. It’s never an easy task when there’s a guest yelling in your face about why their child’s too short to ride the ride. It’s overwhelming but it is part of the job and I always try to relate with the child and say, “I’m not the tallest person, and I was definitely not the tallest kid, so I feel for you,” but it is tough and half the time we find that the guest usually, they just need to … You just need to talk to them a little bit and let … Most of the time you just want to allow them to speak. Usually they get everything off their chest and they’re okay, but you do run into some bizarre instances and all that, but it is just part of the job. Tim Mullooly: “Let’s actually solve this issue, now that you’re calm.” That’s the busy season for you, what are … What’s the off season like for you on a day to day basis? Kenny Taylor: People tend to complain about their 9:00 to 5:00 jobs, I love working 9:00 to 5:00 in the winter time, it’s amazing. I get up, I get to work, I’m out by 5:00. But a lot of the winter time is preparing for the summer time. We’re going over specials, what worked, what didn’t work, what could we add, what food items can we add, what rides should we add, would this ride … how’s the capacity of this ride, what’s the turnover rate, small things you don’t realize that you need to put into the summer time. For instance, we have to get the rides approved to the state, we have to reapply for the permits, all that kind of stuff. It’s a lot preparation for the summer time essentially. Tim Mullooly: Yeah because I feel like there’s so much going on. Like you said, you have such a short window to make your entire years’ worth of money that you have to do all the preparation during that off season to make sure that you don’t miss a step or you don’t have any down time during the busy season. Tim Mullooly: A couple years ago now, we had Hurricane Sandy hit. Obviously Casino Pier, a lot of people saw that picture of the rollercoaster out in the ocean. For your family and for your business, can you talk about just a little bit about what that time was like and what it was like for your family and the business and the process of rebuilding everything back to the way it is today? Kenny Taylor: Obviously it was a very difficult time. I remember I was a junior in college at the time and I … It was parents’ weekend I think the weekend before, my dad was joking around saying, “Oh I should get a generator up here while in Massachusetts,” and no one expected what was going to happen, and the next morning I texted him saying, “How’s everything?” And he said, “It’s bad.” I saw some images on TV and on the internet, and when I saw the rollercoaster in the ocean, it all hit home. It didn’t really hit me too hard until December of that year when I, me and my brother had volunteered to help my uncle out down in Casino Pier to try and clear things out so we could start rebuilding, and seeing the Jet Star out in the ocean was just surreal. The wind whipping and the water hitting the track, it was just crazy. It was a long time coming, the rebuilding process. It was now we know that the pier itself was not that structurally sound. We’ve since rebuilt it that there’s a lot more pile, like wood pilings in the square area. You build to the best of your ability, no one can … You can’t expect … You can’t prepare too well for Mother Nature’s wrath, but you can do as best as you can. I think in the end, the storm made us more resilient. The managers we had and the employees who helped along the way really, really rebuilt that thing really great. It was all about rebuilding memories too. It’s … When your favorite rollercoaster or other rides are gone, you have to try to create new memories for the employees … For the customers, and I credit our staff with really doing that, and especially at Casino Pier. I was there as an intern in 2013, that was the summer after the hurricane and there weren’t that many people around, and the pier itself didn’t open up until July. But just seeing the hard work that the managers and the employees put in to rebuild that and create a new pier for the customers was just amazing, it really was. Tim Mullooly: You said resilient and that word applies in multiple different ways there. The pier itself was actually rebuilt, and also just like you said, teamwork and probably brought a lot of people together to rebuild that as a team. So many years later, Casino Pier is back and better than ever, what’s the feeling like seeing it run even better than before now after going through so much rebuilding and damage from the storm? Kenny Taylor: Seeing people come back, especially like I said, in 2013, when I first started out there, there was really not that many people around. Now you get a lot more people, especially more families too, it’s a great feeling, it really is that not only are people coming back, but they’re bringing their kids and their kids will have memories and eventually they’ll bring their kids, and just circle of life right there. Tim Mullooly: Yeah, exactly. During the off season, you think of new things that you can implement or different rides or food or something. Are there any new exciting things on the horizon for Casino Pier this coming summer, or maybe a year or two after? Tim Mullooly: Don’t want to spoil any surprises? Kenny Taylor: Not this upcoming summer. We … Last summer we had our new roller coaster and the Ferris Wheel, so we’re going to take it easy for a summer and then we’ve got some things on our plate for the summer 2019. Kenny Taylor: So stay tuned for that. Tim Mullooly: Yeah. So I was looking around on your guys’ website and like you said, you do the Easter sale last weekend, can you talk a little bit about some of the different fundraisers or any programs that you do with the surrounding community? Kenny Taylor: Yeah, sure. During our Easter sale, we asked the customers if they’d like to donate a dollar to fulfill the food bank, and we raised a lot of money through that. We were just honored about two weeks ago, Humanitarians of the Year, it has a nice gala. My brother was on the board of that, put that together really nice. Outside of that, we also do a … What’s called a survivors’ day in the waterpark where we honor the fallen state troopers of the New Jersey State troopers and their families. We give them a day in the waterpark on us. Kenny Taylor: That’s a great … The governor … The Lieutenant Governor usually stops by, gives a little speech, and it’s usually a great day. You see families coming together and smiling, and having a great time. Tim Mullooly: Yeah, it’s very cool. Kenny Taylor: It’s a great feeling. Tim Mullooly: Little personal question, what would you say is your favorite ride at Casino Pier? If you had to pick one, I’m sure you look at them every single day. Tim Mullooly: Probably hard to pick a favorite. Kenny Taylor: A little, you would know this. Kenny Taylor: The Busch Gardens rollercoaster you guys forced me on, on the eighth grade trip? Kenny Taylor: After that I realized that if I’m going to stay in this industry, I need to go on the rides even though I want to scream and all that. If I had to give you my Mt. Rushmore of rides at Casino Pier, I’d say our new rollercoaster Hydrus is up there, that’s a great rollercoaster. I do like our Sky Coaster, which is a … You’re harnessed into a parachute upfront and all that. No actual shoot in the back, and you’re winched up about 109 feet in the air and then you release yourself and you swing out over the ocean. Kenny Taylor: That’s one of my favorite rides. Tim Mullooly: I’ve never done that. I’ve seen people on that before, and it’s a little much for me. Tim Mullooly: Not for you. Kenny Taylor: I don’t want to go that one though. Tim Mullooly: Yeah, I’m not the biggest rollercoaster guy, but I remember that eighth grade trip, that was funny. Trying to get Ken to go on all the roller coasters down at Bush Gardens. Kenny Taylor: You told me that there was no loops, and I was not a looping coaster guy, and there was two interlocking actually. Tim Mullooly: There were loops. Kenny Taylor: One was Lochness Monster or something like that. Tim Mullooly: Yeah. Working with a lot of people, you have employees that work for you and you also deal with a lot of customers on a day to day basis. What’s one thing that you would want people to remember you by from a customer standpoint, and then also from an employee standpoint as well? Kenny Taylor: From a customer standpoint, I would want them to walk away from the situation happy, whether it’s they’re smiling, or they said, “He was very helpful. I’d definitely come back.” That’s ultimately my goal in dealing with customers, especially … I’ve had instances, I actually have a couple emails hanging up in my office where someone’s emailed frantically saying I can’t find this order and I send it over to them and they thank me, it’s a great feeling. I’ve made their day, and they’ve made mine just thanking me. From an employee standpoint, a lot of the employees … I learned this when I ran the beach at Jenkinson’s, it’s their summer job. If they come to work excited to work, I’ve done my job. No one wants to dread going into work, especially if you’re a teenager. It’s almost like you’re an inconvenience to them, even though they know deep down that, ‘Hey, this is my job, I need to make some money so I can save up for school or save up for a car, or save up for college.’ Any way to make their days easier, better, and then you get good work out of them is an accomplishment. When we get the international students as well in the summer time, I don’t deal with them as much as I did in 2014 when I was working in the ride park itself, but you want to keep them motivated and happy. They’re here for the summer time and they work tons and tons of hours, and they’re tremendous help. But keeping them motivated and like I said, happy, is a great tool for them. Our ride, our operations manager, Debbie, she’s does a fantastic job of keeping them motivated, and keeping them ready for work. Tim Mullooly: Like you said, with it being their summer job, it’s not their career, so you need to be able to keep them wanting to come into work, so ultimately they’ll do a better job. Kenny Taylor: If we can get them to make it a career that would be even better for us. Tim Mullooly: Moving on to some more open ended questions not generally geared towards Casino Pier. First being how would you define being wealthy? We’ve asked this to pretty much every guest who’s come on so far and gotten some pretty unique answers. Feel like it means something different to everyone, so what does wealth mean to you? Kenny Taylor: I think wealth correlates with happiness in the fact that if you can live off x amount of dollars and be happy, you’re wealthy. You always hear the expression, ‘Money doesn’t buy happiness,’ and I think that’s true. If someone has millions of dollars and they’re not happy, then what’s the point? If you have a family and you can live off a couple thousand dollars a year, you’re wealthy. If there’s … You have no worries, it’s the absence of worrying about your finances I think that is wealth. If it’s … If you’re wealthy through family or through happiness and all that, I think anyone can be wealthy, it’s just a matter of you realizing that it’s not about the money. Kenny Taylor: Yeah, it really doesn’t. I can … I don’t want to say if you can live off a dollar and be happy, I think that’s unrealistic, but if you can, however much money you have and maintain happiness through your family and others, then you’re wealthy. Tim Mullooly: Going back let’s say 10 years, what’s one piece of advice that you would give yourself 10 years ago, Ken? Kenny Taylor: I think the major thing for me would be to learn more aspects of the business. I know a good amount, but I don’t know everything. It’s one of those things when you work in a family business, you want to know every single aspect of the business. Now I’m in my 20s teetering toward my late 20s and there are aspects that I don’t know, and I wish at a younger age I had said, “Let me go see how the arcade works, or how I can fix this arcade machine, how does the ride park run,” when I was 17 or whatnot, I would … That would’ve been nice to learn that. But I did my career path, and here I am, and I’m still learning. It just would’ve been beneficial at younger age that I would’ve learned more. Tim Mullooly: Okay, next question. If you could accomplish one thing with the caveat being that no one could ever know that you did it, what would you do? It’s just a personal thing. I saw an example, I took this question from a previous podcast that I was listening to, and the guy was like, “If you could climb Mt. Everest and no one would ever know that you did it,” just an internal personal thing, what would one thing that you would want to do just for you? Kenny Taylor: I’ve never been much of a runner my entire life. I’ve always wanted to run marathon, but I know I can’t run past a mile. You see me at the gym struggling on that treadmill. Tim Mullooly: Surprising because you’re a very fast person like sprinting. Kenny Taylor: Yeah short distances, yeah. Probably running a marathon, I think everyone who’s ever worked out or gone on a treadmill is always said to themselves, ‘Wow, wouldn’t it be amazing if I could run a marathon.’ I don’t think I have it in me, but if I was ever able to accomplish that, that would be a personal accomplishment, definitely. Tim Mullooly: Because I feel like that tackles both the mental and physical aspect of accomplishing something because I don’t … For me, mentally pushing myself to run that much would … It would probably be harder than the physical part because that’s a mental grind to get through all those miles. Tim Mullooly: I can attest to that. Tim Mullooly: Runs in the family. Tim Mullooly: Just a regular dive. Kenny Taylor: No, I belly flop, and it’s bad. Tim Mullooly: Because you could YouTube it, and try, and I don’t know. Kenny Taylor: I don’t know. Tim Mullooly: We’ll give you some lessons this summer. Tim Mullooly: Alright, last question we have for you, pretty broad straight forward question. What makes you happiest in life? Kenny Taylor: Besides the Eagles winning the Super Bowl? Kenny Taylor: It’s going to sound cliché, it ultimately is family makes me happiest. Whenever we’re all together, even though you work together closely and sometimes you bump heads and all that, but whenever we come together as a whole family and either it’s at my grandma’s house, or one of our other homes, either my grandma’s cooking or my mom’s cooking or someone else is cooking, and we’re all together over, eating and laughing it’s … It genuinely makes me happy and being with them altogether probably makes me the happiest person. Tim Mullooly: If you’re listening to this on iTunes, please subscribe to the podcast to get new episodes every week, and feel free to leave us a review or a comment because it would really mean a lot to us. Be sure to follow us on Twitter and Instagram @LWM_Podcast for more news and updates about the show. If you have a question that you’d like us to answer on Living with Money, get in touch with us. You can email us at LivingWithMoneyPod@gmail.com, you can find us on Facebook and send us a message there, you can tweet at us on Twitter, shoot us a message on Instagram, we’d be happy to answer any of your questions. That’s going to do it for this episode of Living with Money, I want to thank Ken for coming on. Kenny Taylor: Thanks again, Tim. Tim Mullooly: This summer be sure to head down to Casino Pier and hopefully you won’t have to see Ken because your cards will be working correctly, and you won’t be an irate guest, but go down to Casino Pier, check out all the rides, and have some fun. So like I said that’s going to do it for this episode, thanks for listening, and we’ll see you on the next one.